Suzhou Mina Medical Technology Co.,ltd - Suzhou Mina Medical Technology Co.
Suzhou Mina Medical Technology Co., Ltd. is a professional manufacturer of hospital furniture. 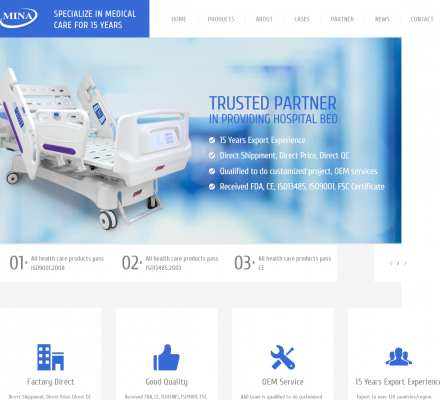 It integrates design, production and sales, and is committed to solving the overall medical solutions for customers. Products are exported to more than 100 countries, and sincerely look forward to working with you. Title: Suzhou Mina Medical Technology Co., Ltd. Description: Health, Health Care Product - Suzhou Mina Medical Technology Co.,ltd. Suzhou Mina Medical Technology Co.